Let's Go is a 1994 album by the American punk rock band Rancid. Released on the influential indie label Epitaph Records, Let's Go initially achieved little mainstream success, though it appealed to the band's fanbase. However, the surprise success of punk rock bands like The Offspring, Green Day and Bad Religion in the mid-1990s brought forth more mainstream interest in the album, and it ultimately reached #97 on the Billboard 200. 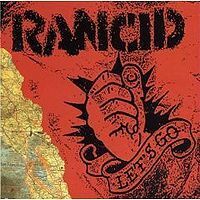 Until Rancid (2000), Let's Go was the only Rancid album to be produced by Brett Gurewitz, although he engineered the band's next album, ...And Out Come the Wolves, which is regarded as a classic from the golden age of the 1990s punk rock in California.